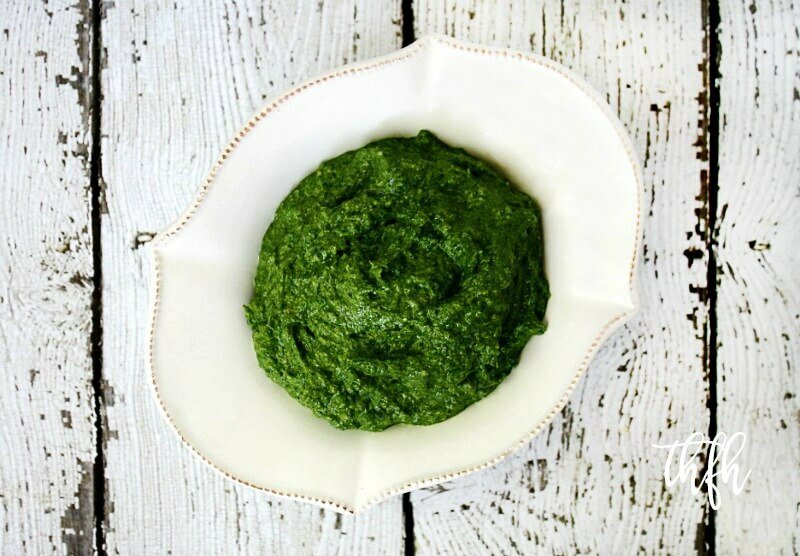 Today I have a non-dairy, vegan Clean Eating Spinach Pesto recipe for you that only has 6 clean ingredients. There are many different varieties of pesto you can make, like my Fresh Herb and Tahini Pesto or this Raw Vegan Red Pepper Basil Creamy Pine Nut Pesto, but I had a lot of extra spinach I needed to use so I made this version with spinach. It’s really easy to make with a Vitamix and is ready in a matter of minutes. I used to buy the organic powdered pesto sauce, but after looking more closely at the ingredients, I knew making it fresh with real ingredients was better so that’s what I’ve been doing ever since. When you make your own pesto from scratch, you can avoid the added maltodextrin, citric acid and silicon dioxide. 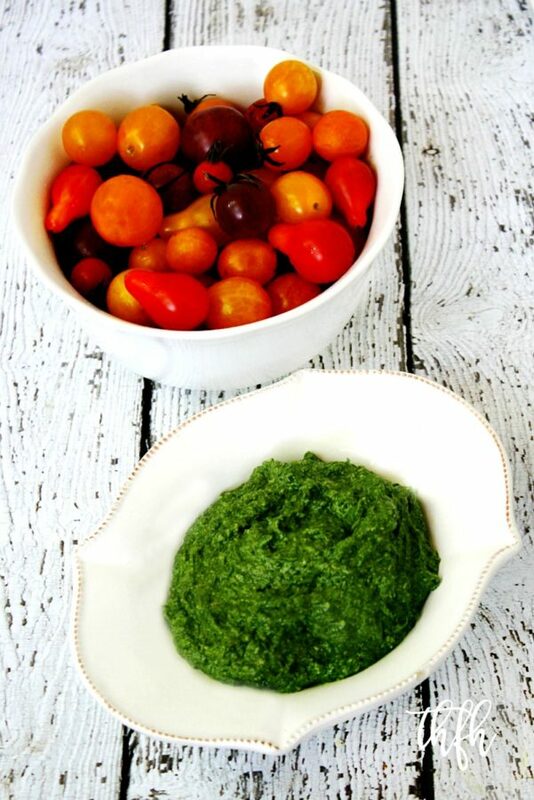 This clean eating pesto version is perfect to use with my Cherry Tomato and Spinach Pesto recipe, on my Gluten-Free Pesto Pizza recipe (in my eCookbook), mixed in with some fresh zucchini pasta or even as a dip. And, it’s raw, vegan, gluten-free, dairy-free, lectin-free and paleo-friendly too! Want more healthy dip recipes? Check out Smoked Paprika Habanero Sauce, Clean Eating Cranberry Sauce, Creamy Mushroom Sauce, or my Clean Eating Cookbook with an entire chapter of 20 healthy, clean eating dip and dressing recipes just like this one that you will love! Add all ingredients to a Vitamix and blend until everything is well combined. Note: I used a Vitamix Professional 750 Series with a wet container and blended starting at speed 1 then slowly moving to speed 10, then slowly back to speed 1 (just long enough to chop the nuts and get it to a puree-type texture). The recipe and photographs for "Clean Eating Vegan Spinach Pesto" by Karielyn Tillman of The Healthy Family and Home website are licensed under a Creative Commons Attribution Non-Commercial No Derivatives 4.0 International License and cannot be used without my written permission. This spinach pesto sounds terrific! I’ve made all kinds of pesto before but I never thought of using spinach. Excellent idea 🙂 Thanks for the recipe!! Hi there Rose! Thanks so much and if I hadn’t opened and thawed a bag of frozen spinach earlier in the day to make a smoothie, the spinach pesto would have never happened lol!